Selecting a consulting engineer is the most important decision a client makes. The success of any project often depends on obtaining the most able, experienced and reputable expertise. Central to the philosophy of the Association has always been that professional fees paid by clients are the member’s only remuneration from the project undertaken. This freedom from conflict of interest is meant to assure objective, unbiased advice from consulting engineering enterprise. As part of its concern for quality of service the Association promotes quality based selection as the most appropriate procedure for the appointment of consulting engineers and the settlement of their fees. The procedures recommended by the Association for reaching agreement on fees are those outlined in the Department of Finance Circular 11/87 entitled “Procedures for the engagement of Consultants and Settlement of fees on Public Construction contracts”. 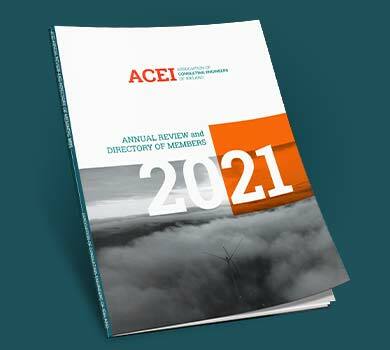 In the absence of any formal legal framework for the establishment of a consulting engineering practice in Ireland, the ACEI, as part of FIDIC, in setting standards for their members based on international best practice, establishes a quality assurance benchmark for the profession, which provides a useful yardstick for clients in determining the appropriate qualifications and experience for consulting engineering practices. The restrictions imposed by the Association on their member companies helps to maintain a high standard of integrity and quality within the firms which we believe is in the interest of both the clients and the public. Members compete against non-members who can operate in the market without any restrictions whatsoever on the level of service being provided or the impartiality of the advice given for the fee being charged. A client in selecting an ACEI member company are aware of the ethical standards expected and if these standards are not met a complaint against the member concerned can be made by the client to the Association. A professional firm in which all or a majority of the partners or all or a majority of the directors and shareholders with voting rights of a company qualify as ACEI Registered Consulting Engineers provided that only a minority of other suitably professional qualified persons or bodies, who are not directly or indirectly concerned or interested in commercial, manufacturing, or contracting interests such as would tend to influence the firm in its independent engineering professional judgement. and who adhere to the Rules for Professional conduct incorporated in the Articles of Association, may also be partners, proprietary directors or shareholders. An Engineering Consultancy, operating in Ireland in which ACEI Registered Consulting Engineers have control of the Consultancy’s affairs. Provided that the consultancy is not a subsidiary or Holding Company of a Company which is primarily engaged in manufacturing or contracting, is in substance owned by the State or a similar public body, or is in substance the Design Department of a development, manufacturing or contracting enterprise.